Propane limited partnership Suburban Propane Partners (NYSE:SPH) is offering investors a hefty 10%-plus distribution yield. Liquefied natural gas export upstart Tellurian (NASDAQ:TELL) doesn't offer a dividend but is looking to tap into the huge expected demand for U.S. natural gas exports. These are both risky investment options. Is one a better buy than the other? Tellurian basically has no business today. What it has are big plans to build natural gas pipelines and a liquefied natural gas (LNG) export facility that will process gas and ship it to foreign markets. The company estimates that there will be a global need for between 100 million and 250 million metric tons per year (MPTA) of LNG capacity required to meet global demand over the coming years. Its proposed LNG facility would have roughly 27.6 MPTA of capacity fed by a series of prospective pipelines in Texas and Louisiana. At this point, the company has started to test demand for the largest pipeline, which will run from key production centers in Texas to the proposed LNG facility in Louisiana. It's also moving forward with the approval process for the LNG facility, which it expects to complete in the first half of this year. Both of these are make-or-break decisions, since a pipeline without the LNG facility wouldn't be particularly useful and an LNG facility with no pipeline running to it would, similarly, not be terribly desirable. The final call on the overall project is expected to be made sometime this year. To be fair, Tellurian has some notable names involved. It's working with Bechtel on the construction front, with the latter putting up some financing as well. Total owns 19% of the company's shares and has agreed to use the facility. Vitol has also agreed to use the facility, and Tellurian hopes that it will invest in the project, too. But even under the best-case scenario, the company won't export any LNG until 2023, with construction starting in late 2019 or early 2020. That means that Tellurian will be facing huge construction expenses and have little to show for it for at least another three to four years. The hope is that this development project will work out as well as Cheniere Energy (NYSEMKT:LNG) and Cheniere Energy Partners (NYSEMKT:CQP) did. They successfully opened the Sabine Pass LNG export facility, one of the first such operations in the United States. 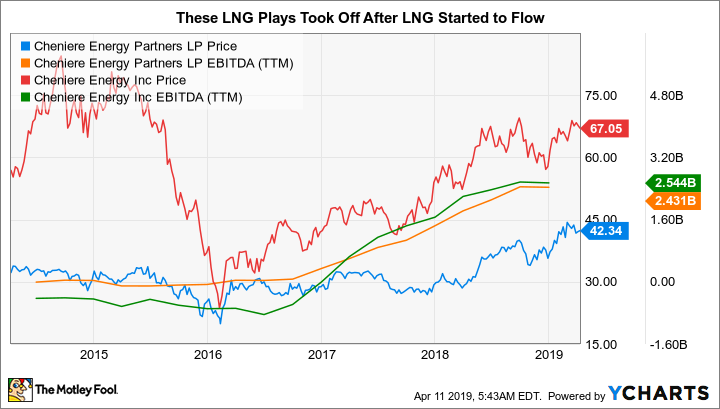 Financial results took off when LNG started to move through the facility in 2016, and so did the stocks. The positive outlook at Tellurian is also based on the fact that the mastermind behind Cheniere is involved in the Tellurian project (he also own 23% of the company's stock). Some industry watchers have very high hopes for Tellurian, which makes complete sense. The problem here, of course, is that there's still a long way to go before Tellurian's got an operating LNG facility and feeder pipeline. And, perhaps more important, there's a lot of money to be spent along the way. Yes, there's huge opportunity, but there are also material risks. Suburban Propane is at the other end of the spectrum in many ways. With a 5% market share, the partnership is the third largest propane distributor in the United States. It operates in 41 states and serves roughly a million customers. Propane has long been used for heating in remote locations, as well as for industrial purposes (vehicles) and farming (drying crops). This is not a big growth business, but it is fairly consistent. That said, recent warm weather that crimped demand coupled with the largely debt funded acquisition of Inergy's propane operations in 2012 for $1.8 billion led Suburban to trim its distribution by roughly 33% in 2017. The goal of that move was to free up cash for continued investment in the core business and to reduce the leverage overhang still hampering the partnership since the close of the Inergy deal. On the leverage front, the company's trailing debt to EBITDA ratio has fallen from over six times in 2016 to around 4.8 times more recently. However, that's largely been driven by improving EBITDA, not a material decline in debt. That isn't surprising when you consider the dynamics of the propane industry. In the heating space, there's a long-term trend of consumers shifting to alternate heating sources and, thus, a slow but steady decline in customer accounts. To offset that, propane companies tend to make frequent bolt-on acquisitions. Suburban made just such a purchase in early 2019, with a price tag of $12 million. The company's EBITDA, meanwhile, will largely be driven by demand, which is a function of heating needs. As you'd expect, weather can be unpredictable and so can Suburban's results, which is why the company is working to reduce its leverage to around four times EBITDA. That, management believes, will give it the cushion it needs to handle weather variations in future years. Meanwhile, it was able to cover its distribution by roughly 1.3 times over the trailing 12 months through the first quarter. It's important to look at a full 12-month period here because propane demand is highly seasonal (customers only put the heat on when it's cold). Although Suburban is calling for demand growth over the next few years, this is not a growth story. Suburban, as a limited partnership, is built to return cash to investors via distributions. The current yield is roughly 10%. That's a big number, which suggests a little uncertainty here (slow customer attrition and the vagaries of the weather are very real headwinds), but isn't out of line with its largest peer, AmeriGas. And with Suburban specifically working to create a buffer on the balance sheet to handle future adverse weather patterns, it looks like Suburban is trying to become a less risky entity overall. 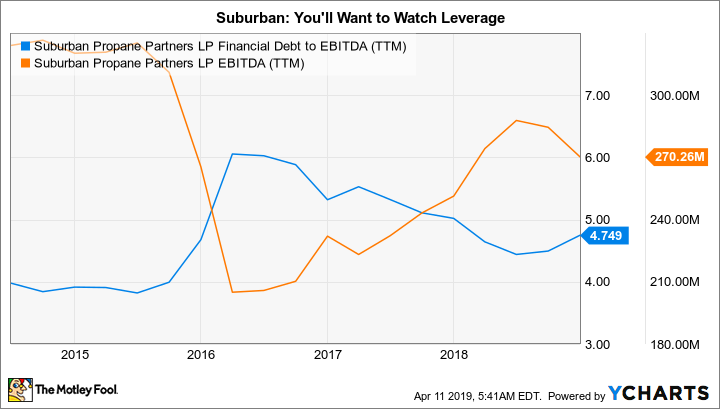 But after a distribution cut, and with it still not down to its target leverage levels, Suburban is far from a low-risk investment -- a fact highlighted by the high yield. A key piece of investing is balancing risk and reward. That's not a simple task, particularly for optimists who get pulled into a good story. Sometimes investors are better off with a less exciting story and smaller but more predictable returns. To be honest, there are better ways to play the energy space than Tellurian and Suburban Propane. Midstream energy giants like Enterprise Products Partners and Magellan Midstream Partners have notable yields, much less risk, and well-defined growth plans. However, if you had to pick between Tellurian and Suburban today, Suburban is likely the better option because it actually has a business and is returning cash to investors via distributions. Tellurian's big ambitions are too far away at this point, and most would be better off waiting until there's further progress toward its goals.